Next at number 4 we have id Software’s first person shooter Doom 3, a highly influential game that was a critical and commercial success! 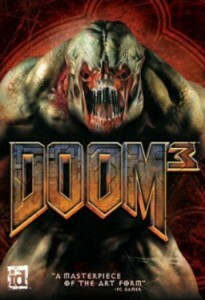 id Software’s 2004 first person shooter, horror title for the PC (Windows and Mac OSX), Linux, and Xbox – Doom 3. 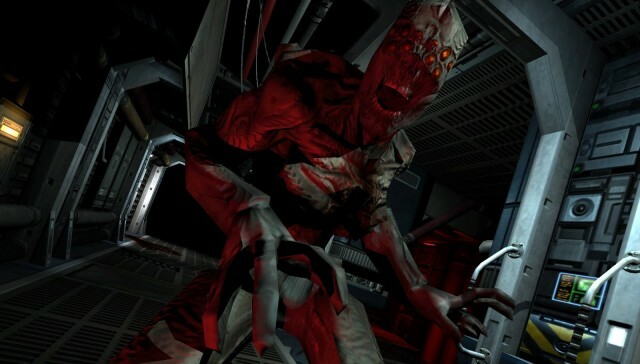 A sci-fi horror masterpiece, Doom 3 is like nothing you’ve ever experienced. Dramatic story line, pulse-pounding action, incredible graphics, and revolutionary technology combine to draw you into the most frightening and gripping first person gaming experience ever created. The player, an anonymous space marine, must fight through the base and find a way to stop demons from Hell attacking Earth. Another critical and commercial success, Doom 3 really helped to perfect the first person shooter, horror game genre. Without this title it’s entirely possible that many modern games would never have seen the light of day! A highly influential title, Doom 3 sits firmly at number 4 in our count-down. The gameplay is a simple “runner and gunner” with smooth, user-friendly mechanics and little terror thrown in for good measure. Mission objectives are fairly straightforward; the player must make their way through the levels defeating each enemy that crosses your path. Ten weapons could be used, including conventional firearms and explosives such as the submachine gun, shotgun and grenades, plasma weaponry, the BFG 9000 and chainsaw weapons. There were also a wide array of enemies displaying different strengths, weaknesses and tactics! Doom 3 was also released with a four-player multiplayer element, including four game modes in a “Deathmatch” style. Doom 3 incorporated simple mechanics and just the right amount of variation. The game simply did what it aimed to, and did it well. Darkness also played a huge part in the Doom 3 experience! The absence of bright lights really piled on the pressure in many areas and substantially lessened visibility. id Software also utilized unified shadowing and lighting to create shadows on the creatures and backgrounds. Combine these strong shadows with dark environments and you can never quite make out what is going on around you! This really helped to create a feeling of unease. The story of Doom 3 was entirely new, establishing a new mythos and title separate from the previous games. A reboot of the Doom franchise, it is set in 2145 on Mars, a military-industrial conglomerate has set up a scientific research facility to develop fields such as teleportation, biological research and advanced weapons design. However, the teleportation experiments inadvertently opened a gateway to Hell, resulting in a catastrophic invasion by demons. 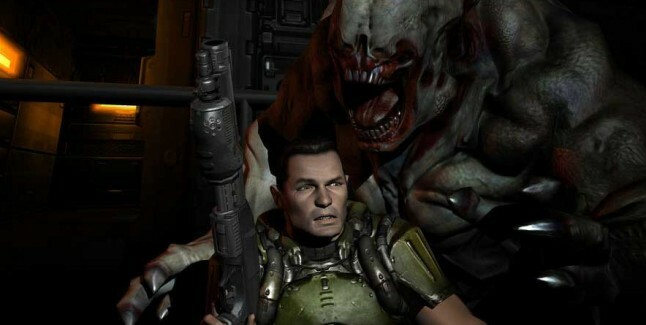 Similar to the film Event Horizon, Doom 3 was a terrifying mix of hell and the horrors of space. Without this game I doubt Dead Space 1 or 2 would even exist! Doom 3 was a critical and commercial success for id Software; by the beginning of 2007, over 3.5 million copies of Doom 3 had been sold! This game has influenced many current-gen first person shooter/horror titles and for that reason alone should be played. It is however just one game in a truly awesome franchise, so I would also urge you to check the rest of them out if you ever have the chance!